For Disneyland, the year 1959 was a transformative year that Walt himself described as "the second opening of Disneyland." Disneyland shifted from a regional attraction with its primary attendance coming from the Southern California area to truly a larger national destination with a higher percentage of its guests coming from other states and countries. Of course, in 1959, it was most notable for the introduction of the first three "E-Ticket" attractions: the Disneyland-Alweg Monorail, the Submarine Voyage, and the Matterhorn Bobsleds. In addition, those three attractions marked the fact that new Disneyland attractions did not have to be directly connected to Disney films, like Frontierland's Davy Crockett, Tomorrowland's television shows, Adventureland's True-Life Adventures series or Fantasyland's animated cartoons. Walt described 1959 as the "second opening of Disneyland." These three attractions marked the beginning of Disneyland itself becoming its own personality that would lead to the creation of attractions like The Enchanted Tiki Room, the Haunted Mansion and Pirates of the Caribbean. Although watching the filming of the live action film Third Man on the Mountain (1959) inspired Walt to create a mini-Matterhorn at Disneyland, the film has no bobsleds or skyway. The Submarine Voyage is based on the real-life U.S. submarine fleet mixed with a little Disney fantasy of an underwater volcano, mermaids and a sea serpent, rather than the classic Disney live-action film 20,000 Leagues Under the Sea (1954). Besides the three new attractions, a flyer given to guests promoted the expansion of the Autopia into a "Super Autopia" and additions to the Motor Boat Cruise. Walt would also claim that the Skyway going through "Glacier Grotto" in the Matterhorn constituted yet another new experience. The Fantasyland Autopia opened in 1959. The Tomorrowland Autopia was instantly popular when it opened with the park in 1955, but it led to guest challenges with long lines and disappointed smaller children not tall enough to operate the vehicles. The Junior Autopia in the Fantasyland area opened roughly a year later in 1956 to alleviate those problems by offering more cars, but with foot pedals and booster seats designed to accommodate smaller children. Unlike its predecessor it featured a guide track for the cars. To handle even smaller children, the Midget Autopia opened in 1957. The Junior Autopia closed in 1958 to be replaced by the newly expanded Fantasyland Autopia. Both the Tomorrowland and Fantasyland Autopias featured similar double-sided boarding areas for the two tracks at each attraction, beautifully landscaped straight-aways, bridges, and cloverleafs. At one point, all four ride tracks converged creating briefly a four-lane superhighway on top of the pine covered McKim Hill (named after Imagineer Sam McKim) which was actually the top of the Submarine Voyage building. In 1959, the new Mark V design for the cars was introduced for both attractions that were sponsored by Richfield Oil which offered a Disneyland driver's license to guests. The Motor Boat Cruise located between Tomorrowland and Fantasyland opened in 1957. The little boats themselves were well crafted of mahogany plywood and allowed young skippers to seemingly navigate through some treacherous obstacles like outcroppings of rocks. The boats were painted white with one additional solid color of red, blue, green or yellow on the hull. The murky water was only a few feet deep, but gave the impression of being much deeper and the crafts glided along on a track much like the Mark Twain steamboat. The trough was the guide all the way around the loop. Two guide wheels (one in front and one in back) mounted on a vertical axle would guide the boats, but allow them to float. For 1959, not only did the boat ride pass underneath the new Autopia and Monorail tracks but had a rushing "white water rapids" section. With the new attractions, Walt realized he would need added passenger capacity for the Disneyland Railroad, one of the most popular attractions at the park. He authorized Imagineer Roger Broggie to locate another vintage Baldwin engine to restore rather than building a new train from scratch to save some money. The passenger cars, however, in order to be durable and safe enough for the guests needed to be custom built. Broggie found a train in New Jersey that had been built at the Baldwin Locomotive Works of Philadelphia in April 1925, the same company that had built the Fred Gurley. It had spent decades hauling sand for the Raritan River Sand Company of New Jersey and an additional eight years operating at a small amusement park near Freehold, N.J.
Broggie paid $2,000 for the engine, but after all the restoration was done over a year's time, the final cost was nearly $58,000. The train got lost in shipping from New Jersey to California and an angry Walt called the president of the Atchison, Topeka and Santa Fe Railway, Ernest S. March, who located the car with the engine somewhere in Pennsylvania and got it re-routed to Los Angeles. Walt decided to name the engine after Marsh. Animator Ward Kimball suggested the engine be made over to resemble the Montezuma, the first locomotive built for the Denver & Rio Grande Railway and Walt eagerly agreed. It was painted a bright red with gold trim and was nicknamed by cast members the "Holiday Red." It was officially added to the railroad on July 25, 1959. Of course, the Disney animated feature Sleeping Beauty was finally released to theaters so that Disneyland guests got a fuller understanding of why the castle was named after the character and the walk-through attraction started to make more sense. It was the first time that an attraction opened at a Disney theme park before the actual film was released. More than 3,650 people worked at Disneyland in 1959 with a payroll of $10.5 million. 835 businesses within Orange County benefited directly by supplying good and services to the park. Store and restaurant leases were expiring and not being renewed so that Disney itself could take over handling those locations. Main Street was enhanced by the addition of the Disneyland Flower Market with its handmade artificial flowers and The Hills Brother Coffee House and Coffee Garden. Hills Brothers coffee was "the exclusive coffee of Disneyland and the Disneyland Hotel". Hallmark replaced Gibson selling greeting cards in the park and in an unusual agreement was allowed to keep control of its retail space as Disney took over other stores. The Upjohn Pharmacy added a six-foot plastic model of the basic cell mechanism of life. Imagineers Yale Gracey and Rolly Crump were teamed up to update the effects on the Fantasyland dark rides. They added glow-in-the-dark eyes in the Snow White forest scene. Mr. Toad's barrels became three-dimensional instead of cut-outs. Peter Pan got an improved volcano effect. Alice in Wonderland got the gag of the Mad Hatter pouring an endless stream of tea. More importantly, the two would start work together on creating illusions for a haunted house attraction. The tradition of annual Rose Bowl teams visiting Disneyland began when the University of Washington and University of Wisconsin players toured the park prior to their January 1, 1960 game. In these early years, money was tight at Disneyland, so Walt looked for creative but inexpensive ways to "plus" the experience for guests by partnering with local clubs and with businesses that already operated at the park for special events. For instance through animator Ward Kimball's connections with the Horseless Carriage Club of America, Walt arranged an annual event where the members attired in turn-of-the century costumes showcased their vintage vehicles in a parade down Main Street and then parked them in the Town Square for the guests to examine. In 1959, the event took place on September 27. Walt also wanted to cross-promote his own television shows so in addition to having the Mouseketeers appear at the park and sign autographs, he scheduled Zorro Days weekends where the stars of the ABC television show showed up at the park. The one in 1959 occurred during Thanksgiving weekend November 26-29. There were four shows each day. The first three included a parade down Main Street ending in Frontierland where actor Guy Williams costumed as Zorro got off his horse and ran into the Golden Horseshow Revue and Buddy Van Horn, his stunt double, appeared on the roof in costume battling the Spanish soldiers and swinging down to the balcony. The fight continued over to the upper decks of the Mark Twain steamboat where Zorro forced at sword point the evil Captain Monastario into the Rivers of America along with some of the other soldiers. The final show took place at Magnolia Park where Williams as Zorro signed autographs and did fake sword fights with children who had come to the park dressed in black capes and masks. The Quaker Oats Company operated the Aunt Jemima's Pancake House in Frontierland since 1955. They also sponsored the Aunt Jemima Community Pancake Days around the country featuring an odd pancake race as part of a fundraising program for local clubs and organizations. Pancake races were a longtime U.K. tradition in the city of Olney where housewives would race down a street flipping a pancake in a skillet. Starting in 1957, Disneyland sponsored the Western Regional qualifying round in partnership with Quaker Oats until 1964 that determined who would go to the Nationals. In 1959, the competition took place February 7 and 8. The winner received a check for $100 presented by Aunt Jemima (actress Aylene Lewis until her death in 1964 and sometimes in the 1960s actress Palmere Jackson portraying the character) in addition to a plaque signed by Walt Disney, an enormous Disneyland food basket with items like Aunt Jemima Pancake Flour and Swift canned meats, an Aunt Jemima cigarette lighter, an umbrella, and a fish knife in a sheath. Real housewives, in housedresses, aprons and high heels, raced down Main Street U.S.A. deftly avoiding the trolley tracks while flipping a pancake from a skillet over three different ribbons that stretched eight feet overhead across the street. Each of the two dozen participants had been winners in their local competitions usually sponsored by a local supermarket or a club like Kiwanis or Lions. 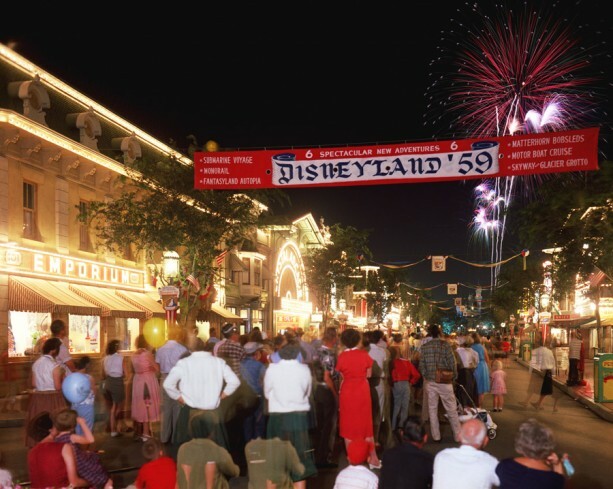 Perhaps one of the most unusual events took place at Disneyland on September 5, 1959. It was the first (and last) annual Car Club Day and Autocade. It was a one-day event with the participants driving their cars down Main Street USA and continued on to the Holidayland area where they were displayed outside the old Mickey Mouse Club Circus tent for judging. There were a lot of stock Model Ts and a couple of Corvettes, as well. As soon as the "hot rodders" showed up, Disney management got nervous as they were not the typical Disneyland guest. Ray Anderegg was there. Bob Johnson's car was in the show and Ed Roth later bought it and modified into Tweedy Pie. The pre-bubble top X-Sonic Tony Bachiero's 57 Ford Custom Corvette was there. All the participants were given a special dash plaque featuring Sleeping Beauty Castle on the right and a hot rod facing the viewer on the left. In the upper left was the date. Ed "Big Daddy" Roth was an iconic car customizer who opened his own shop in 1959 where he built his scratch-made custom hot rod The Outlaw using fiberglass. He was often paid to bring it to display at car shows and he attended this event. His most popular creation, Rat Fink, was created after this show. Rat Fink was a green, comically grotesque and depraved looking rat in red overalls. The story Roth told was that he sketched the creature as the anthesis to Mickey Mouse after becoming sick of seeing so many children wearing the trademark ears. The word "rat fink" was already part of the popular vernacular. The character was first advertised for sale in the July 1963 issue of Car Craft magazine but that advertisement stated it was already "the rage in California". That same year Revell Model Company issued a plastic model kit of the character. The show itself was covered in the March 1960 issue of Rodding & Re-Styling magazine. For decades there were rumors of the participants drinking heavily and some of the kids who worked at Disneyland getting into a rumble in the parking lot that resulted in future events being cancelled, but these are just urban legends. Since a police officer had backed the event, there was a heavy police presence so it was doubtful any trouble occurred. "I know about the show because my father and my brother-in-law put the event together and produced it. My brother-in-law at the time was the president of the Road Lords car club of east Los Angeles and was well connected to the custom car builders in the Los Angeles area as well as knowing many members of the Los Angeles police department. "He was really good friends with a police officer back then who suggested that he hold a car show at Disneyland and the officer had some connections with the management there. At the time the park was only about 4 years old and they were hungry for special events to bring more customers to Disneyland. My father and brother-in-law bought all the trophies and plaques with their own money. "I remember that George Barris and Big Daddy Ed Roth were two of the more prominent business owners that showed their wares, with Ed and his staff producing T-shirts with his custom airbrush designs. I remember such cars as the Kopper Kart, Norm Grabowski's 'Kookie T' which was featured as Edd Byrne's character's car (he was "Kookie" on the TV series 77 Sunset Strip), and Ed Roth's Outlaw. "I suspect that the one-day show was not a financial success for my father and brother-in-law because they never duplicated it or talked about it after the one day event." The Stanford Research Institute presented an economic impact report to the Orange County Board of Supervisors for the year 1959. It stated that more than 16.6 million guests had visited the park, or roughly one in every 10 Americans. The 15 millionth visitor went through the turnstiles in April. However, the real story for Disneyland attendance in 1959 was the one person who was not allowed to go to the park. Nikita Khrushchev, premier of the Soviet Union and a fiery opponent of American capitalism, arrived in the United States on September 16, 1959 for an extended 11-day visit to the United States. During his trip, he visited several American cities, including a stop in Los Angeles on September 19, where he started his day on a soundstage at Twentieth Century Fox Studios seeing a scene from the movie Can Can being filmed. Supposedly, at lunch, comedian Bob Hope and actors Frank Sinatra and David Niven urged Mrs. Khrushchev that she should visit Disneyland and that they would take her there themselves because it was so safe. The Khrushchevs had previously requested such a visit, but the Secret Service had strongly urged against it for security reasons. Mrs. Khrushchev told her husband how disappointed she was. Khrushchev's famous temper probably got the better of him and he stood up and in a voice shaking with emotion, took the opportunity to complain about being prevented from visiting Disneyland. "Just now I was told that I could not go to Disneyland. I asked 'Why not? What is it? Do you have rocket-launching pads there?' I do not know. 'We,' which means the American authorities, 'cannot guarantee your security if you go there.' What is it? Is there an epidemic of cholera there or something? Or have gangsters taken over the place that can destroy me? This is the situation I am in. I can not find words to explain this to my people." The State Department later said that Mrs. Khrushchev and her daughters were free to attend Disneyland, but Mr. Khrushchev had said that if Disneyland wasn't safe for him to visit, then it wasn't safe for his family to do so. The newspaper reports focused on Khrushchev's outburst at not being allowed to visit Disneyland instead of the prepared speech he gave later that evening. Soon, editorial cartoons and comedians were commenting on the tantrum and providing additional publicity for Walt's park as well as sparking curiosity to go and see what the Soviet leader had missed. "We didn't refuse him permission. No, we were all set. You see, we work according to what the State Department wants to do and Khrushchev was a guest of the government. Both the State Department security and the Soviet security had come and cased Disneyland and they were all set. And I was all ready. "We had different shots, places where we'd take pictures with Khrushchev and I had one that was my favorite. We'd be lined up in front of my eight submarines. I'd be pointing to Mr. Khrushchev and saying, 'Well, now, Mr. Khrushchev, here's my Disneyland submarine fleet. It's the eighth-largest submarine fleet in the world'." 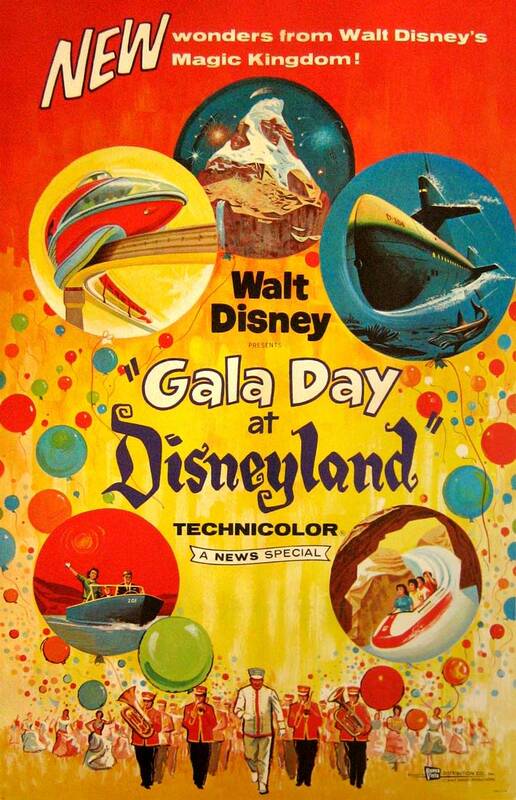 Gala Day at Disneyland was a 27-minute featurette that talked about new attractions and entertainment at the park. 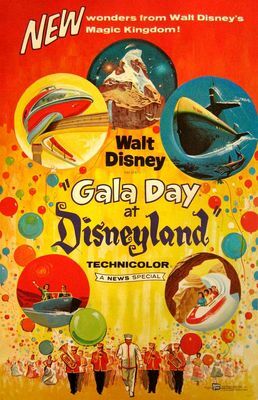 A 27-minute Technicolor documentary featurette entitled Gala Day at Disneyland was released to theaters January 21, 1960, showing some of the parade and dedication ceremonies for the new park attractions. A 90-minute black-and-white television special, Kodak Presents Disneyland '59, had been filmed of these same ceremonies on June 14, 1959, and shown on the Los Angeles ABC television station the following night at 7:30 p.m. So 60 years ago was the real beginning of the Disneyland that many of us remember today.